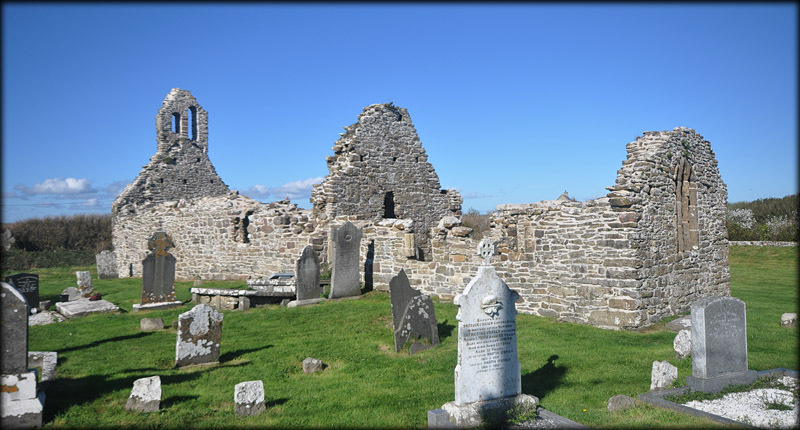 It is very fitting that we came upon this delightful church as we were on the way to the medieval lighthouse at Hook Head. St Dubhan, who came to Hook Point from Wales in 452 A.D and established a monastery on this site, is believed to have lit the first warning beacon for ships on the point shortly after his arrival. This beacon had been maintained by the monks for 700 years until the current lighthouse was built. The original east wall of the medieval church (now in the centre of the church) includes remains of antae (projections of the side walls beyond the gable) and evidence for a round-headed window in which a doorway was inserted to give access to the later chancel. The nave dates from the 13th century and the chancel was added later. Nearby is Hook Medieval Lighthouse. Situated: From Wexford take the R733 west to Balliniry Turn left onto the R734. After 5 klms turn right to stay on the R734, then take the first right, then first left, after 9 klms turn right. The church is down here on your right. Discovery Map 76: X 7345 9857. Last visit Sept 2009.